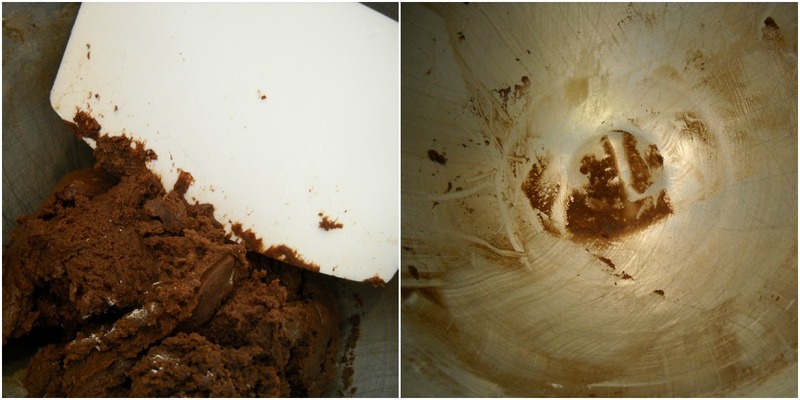 Sift flour, cocoa powder, baking powder, baking soda and salt into a medium bowl. In the bowl of a stand mixer, cream butter and sugar until light and fluffy, a solid 3 minutes. Add the egg, Crème de Cocoa and vanilla. Beat well. With the mixer on low speed, gradually add the flour mixture. Mix well. Dough will be tacky but will hold its shape. Flatten each half on plastic wrap until about 1/2 inch thick. This is allow you to roll the dough less, thus using less flour and achieving a very tender cookie. Wrap both halves in plastic wrap and refrigerate for at least an hour. On a lightly floured surface, roll out one piece of the dough to 1/8 inch thickness. This is beautiful dough. So easy to roll out. You will use very little flour, which is great because you will have a very tender cookie. Did I mention tender cookies? Tender, not fragile. Place on prepared sheet pan. Bake as directed until the cookies are just firm to your touch and fragrant. Chocolate can burn easily so please watch these little cuties. Remove from the oven and let set on the pan for one minute. It will look like little curds. With the mixer on low speed, gradually add the sugar and salt. Beat on medium speed until all the sugar is incorporated. Scrape bowl as needed. Add Frambroise in 1 tbsp increments, beating on medium after each addition, until spreadable. To assemble sandwich cookies, I used a pastry bag fitted with a large round tip to fill the underside of one cookie. 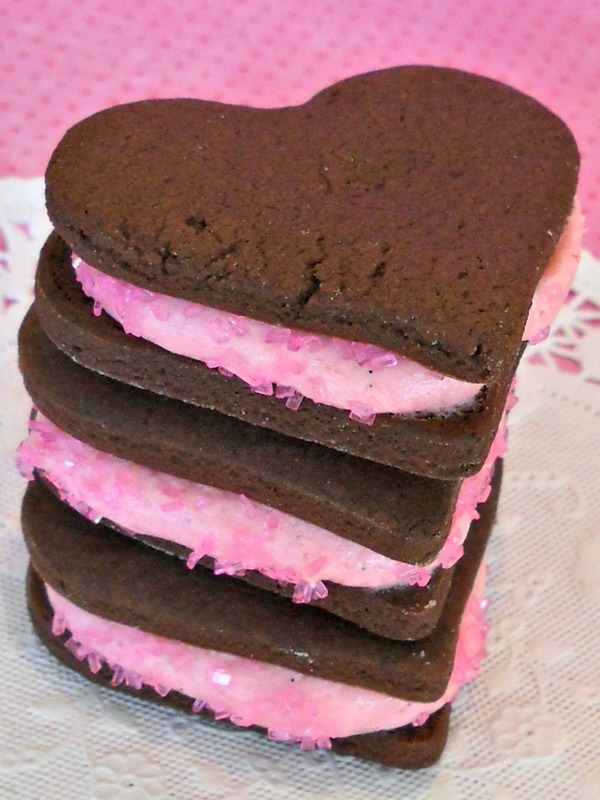 Place another cookie on the filling to form a sandwich (top sides facing out). Sprinkle the exposed filling with sanding sugar or sprinkles. Or, leave naked. ;-) Refrigerate until the filling is set. 1. Sift flour, cocoa powder, baking powder, baking soda and salt into a medium bowl. 2. In the bowl of a stand mixer, cream butter and sugar until light and fluffy, about 3 minutes. Add the egg, Crème de Cocoa and vanilla. Beat well. 3. With the mixer on low speed, gradually add the flour mixture. Mix well. Dough will be tacky but will hold its shape. 4. Divide dough in half. Flatten each half on plastic wrap until about 1/2 inch thick. Wrap in plastic wrap and refrigerate for at least an hour. 5. Preheat oven to 350F. Line two sheet pans with parchment paper. 6. On a lightly floured surface, roll out one piece of the dough. Leave the other half in the refrigerator. 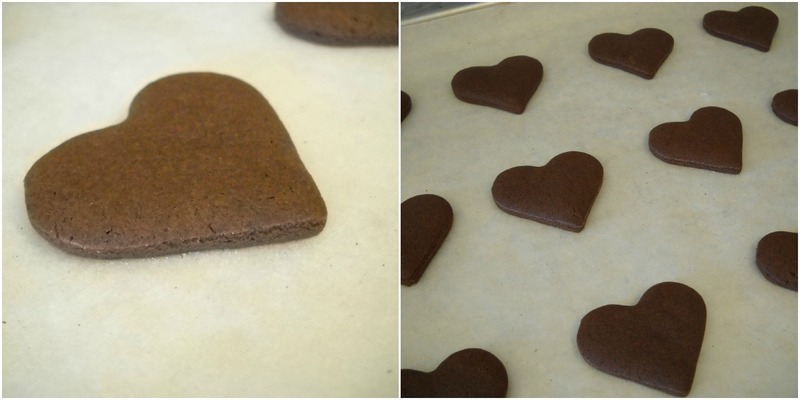 Cut out heart shaped cookies and place on prepared sheet pan. Re-roll dough and repeat. Use as little flour as possible. 7. Bake for 6 minutes for 1 1/2 inch cookies (measured from top to bottom) until just firm to the touch and fragrant. * Remove from oven and let set on pan for one minute. Remove to a wire rack and cool completely. * 2 inch cookies will take a few minutes longer. 1. In the bowl of a stand mixer, cream butter and shortening. Add the vanilla and raspberry puree and mix on medium until emulsified (will look like little curds). 2. With the mixer on low speed, gradually add the sugar and salt. Beat on medium speed until all the sugar is incorporated. Scrape bowl as needed. 3. Add Frambroise in 1 tbsp increments, beating on medium after each addition, until spreadable. 1. 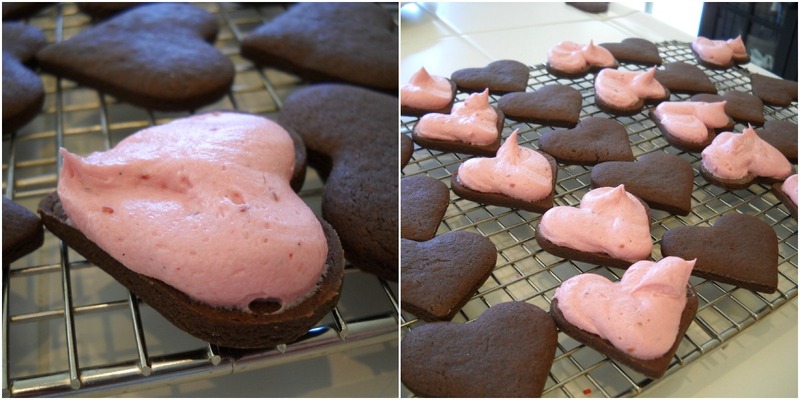 Using a knife or pastry bag fitted with a round tip, fill the underside of one cookie. 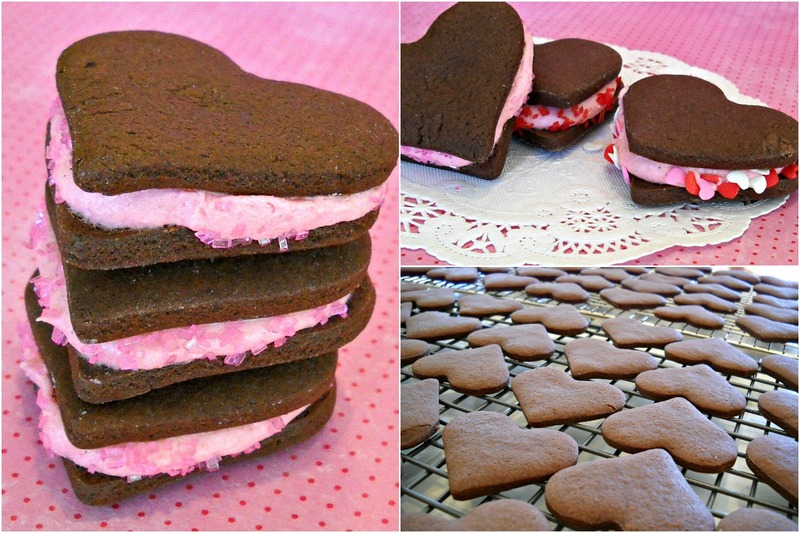 Place another cookie on the filling to form a sandwich (top sides facing out). 2. Sprinkle the exposed filling with sanding sugar or sprinkles. 3. Refrigerate until filling is set. Store in a closed container between wax paper. Ah, thanks, Susan! I really had fun with these and easier than I had ever thought. :) I love easy. 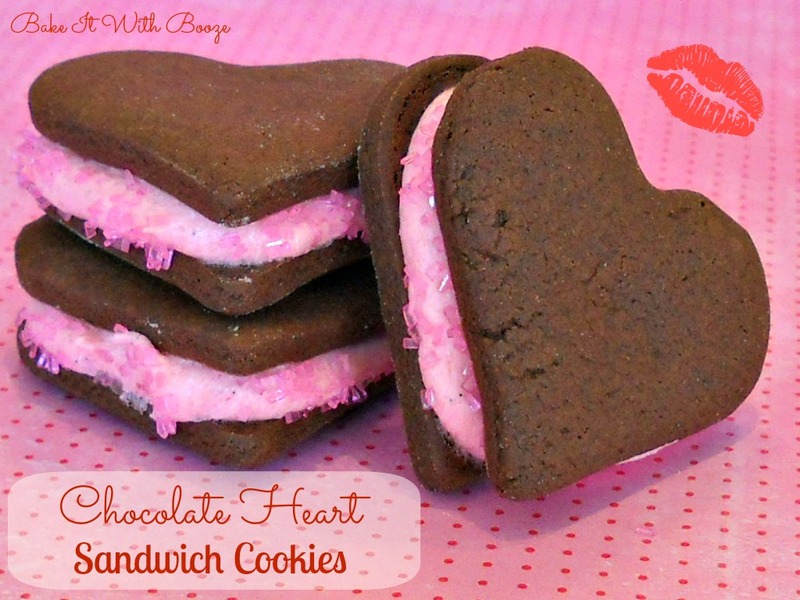 I love chocolate heart sandwich cookies! These look delish! Thanks, Dorothy, and they are! :) Sturdy cookies but still soft. Freeze well, too. But, there weren't many to freeze! Those are beautiful. I am always so afraid that I'm going to overwork a dough like that but your steps seem like I could do them. Maybe variations with different creams; for some reason I'm thinking coconut. Such a cute cookie! I'm thinking they would be great for an anniversary, too. I agree! Thanks for stopping by, Rachel! The sprinkles really make these cookies look special! I bet they were really tasty and that they disappeared very quickly at work.